The amazing array of life an apple tree can lure into a garden. 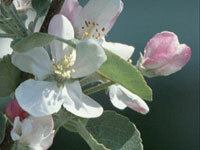 Ever wonder why apple blossoms are so pretty? It's because apple trees are cousins, several times removed, from roses. Apple trees grow a lot more than just rosy fruit - they grow and house a multitude of insects, too. Tent caterpillars, tussock moths, coddling moths, woolly apple aphids - not to mention two-spotted mites - are just a few of the creatures that call an apple tree home. Add to that the thousands of visitors that drop by every day and you start to see the amazing array of life an apple tree can lure into a garden. In this episode of The Secret World of Gardens we explore life on an apple tree from the first buds to when the last fruit falls.